Gestation is the period of development inside a female viviparous species of one or more offspring; that is, a time period involving the carrying of an embryo or fetus inside the uterus or female reproductive organ of a viviparous animal. The time of gestation varies greatly among animals. For example, the European rabbit has a gestation length of about 30 days, and they produce about five to seven liters per year (Angerbjörn 2004). The gestation period for an elephant is about 22 months, the longest for any land animal. Gestation in marsupials tends to be shorter than that of placentals (the marsupial cat, Dasyurus viverrinus has a gestation period of only eight days) as the immature young are raised in a pouch after birth until early infancy. Gestation is one stage in the development of a live-bearing animal. During this stage, under the protective environment of the mother's womb, the young organism develops its anatomy and physiology to be able to survive in the outside environment. Gestation represents a sacrifice on the part of the mother (or father, in the case of the unique Syngnathidae family of fishes, such as seahorses), who have to carry and supply the energy for the developing offspring. However, it provides a means to protect the offspring from threats in the external environment during a crucial developmental stage. The human gestation period is about 38 weeks from fertilization (conception), or approximately 40 weeks from the last normal menstrual period (LNMP) in humans. Thus, it takes about nine months. Viviparous animal are those where the offspring, as an embryo or fetus, first develops inside the body of the mother and the mother then gives live birth. This can involve having the offspring develop within the protection of an egg inside the mother, with the offspring nourished by the egg yolk, or it can involve being nourished directly the mother, not within an egg, such as with placental animals. In placental viviparity, as with humans, there is a placenta connecting the mother with the developing fetus. Gestation is the time period, between fertilization and the birth of the offspring, when the mother is carrying the offspring in her body. This time period can be further divided into embryo and fetus. The term embryo sometimes is used for the time period of an organism at any time after fertilization and before birth or hatching. Others limit the term to the time between fertilization and when it is anatomically and physiologically complete (fully developed) and able to survive as a separate organism. After this comes the fetus, which is the time period immediately after the embryo stage up until birth. The starting point at which a fetus begins may be imprecise because the exact time period corresponding to the embryonic stage generally is imprecisely defined. However, in humans, the term embryo is precisely defined. It is reserved for the developing organism from conception and implantation until the first eight weeks (sometimes seven weeks), after which it is called a fetus. At eight weeks, the human being is not fully developed nor able to survive as a separate organism. The fetus then is defined as from eight weeks (or seven weeks) after fertilization until birth. Human pregnancy, being about nine months long, can be divided into three trimesters, each roughly three months long. The First Trimester is from conception (the 0th week) to the end of the 12th week, the Second Trimester is from the 13th through the 28th week, and the Third Trimester is from the 29th week through the 36th week. In human beings, the time interval of a gestation plus two weeks is called gestation period, and the length of time plus two weeks that the offspring have spent developing in the uterus is called gestational age. The extra two weeks is because gestational age is counted starting from the last menstrual period (LMP), rather than actual conception. However this extra two weeks is not typically added when talking about animals. In humans, birth normally occurs at a gestational age of 37 to 42 weeks. Childbirth after 24 weeks is usually considered "viable" (Mayo 2007). Childbirth occurring before 37 weeks of gestation is considered "preterm." In the United States, twelve percent of births are preterm (MD 2008). Preterm and low birth weight babies make up the second leading cause of infant death at about 17 percent. It is estimated that two million babies worldwide die annually within 24 hours of birth. 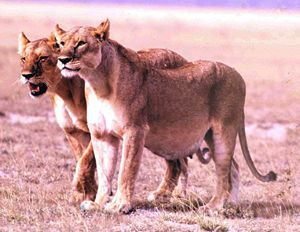 In mammals, pregnancy begins when a fertilized zygote implants in the female's uterus and ends once it leaves the uterus. Among rodents, the families Muridae (rats and mice) and Geomyidae (pocket gophers) have short gestation periods (17 to 45 days), while rodents such as Caviidae (guinea pigs and relatives) and Erethizontidae (porcupines) have long gestation periods (from 60 to 283 days) (Honeycutt 2004). Among marsupial animals, the range is from eight days (marsupial cat, Dasyurus viverrinus) to forty days (red-necked wallaby, Wallabia rufogrisea). A viviparous animal is any animal employing vivipary: the embryo develops inside the body of the mother, as opposed to outside the mother in an egg (ovipary). The mother then gives live birth. The diversity of viviparous animals means gestation is a widely varied phenomenon. The less developed form of vivipary is called ovoviviparity, where the animals develop within eggs that remain within the mother's body up until they hatch or are about to hatch. The embryos are nourished by the egg yolk, rather than the mother's body. That is, a maternal-fetal vascular connection is lacking. However, the mother's body does provide gas exchange. Ovoviviparity occurs for example in most vipers. Ovoviviparity is employed by many aquatic life forms such as fish and some sharks, reptiles, and invertebrates. The young of ovoviviparous amphibians are sometimes born as larvae, and undergo metamorphosis outside the body of the mother. The more developed form of vivipary is called placental viviparity. In this case, the embryo is nourished by the mother's body and is not encased in a egg. That is, there is a maternal-fetal vascular connection, with nutrients, gases, and waste products exchanged via this vascular organ, the placenta. Viviparous offspring live independently and require an external food supply from birth. Mammals are the best example of organisms with placental viviparity, but other organisms also exhibit this, such as placental sharks, scorpions, and velvet worms. Certain lizards also employ this method such as the genera Tiliqua and Corucia. The placenta is attached directly to the mother in these lizards, which is called viviparous matrotrophy. The Syngnathidae family of fishes (pipefishes and seahorses) has the unique characteristic where females lay their eggs in a special place on the undersurface of the trunk or tail, which may or may not be developed into a pouch, and the male incubates the eggs (Nelson 2006). Fertilization may take place in the pouch or before implantation in the water. Included in Syngnathidae are seahorses, the pipefish, and the weedy and leafy sea dragons. Syngnathidae is the only family in the animal kingdom to which the term "male pregnancy" has been applied (Jones and Avise 2003). Angerbjörn, A. 2004. Hares and rabbits (Leporidae). Pages 505 to 516, in B. Grzimek et al. Grzimek's Animal Life Encyclopedia. Detroit, MI: Thomson/Gale. ISBN 0787657921. Honeycutt, R. L. 2004. Rodentia (Rodents). Pages 121-129 in B. Grzimek, D. G. Kleiman, V. Geist, and M. C. McDade, eds., Grzimek's Animal Life Encyclopedia, volume 16. Detroit: Thomson-Gale. ISBN 0787657921. Jones, A. G., and J. C. Avise. 2003. Male pregnancy Current Biology 13(20): R791. Retrieved September 18, 2008. March of Dimes. 2008. Preterm labor March of Dimes. Retrieved September 18, 2008. Mayo Clinic. 2007. Fetal development: What happens during the second trimester? Mayo Clinic. Retrieved September 18, 2008. Nelson, J. S. 2006. Fishes of the World, 4th edition. Hoboken, NJ: John Wiley & Sons. ISBN 0471250317. All links retrieved June 21, 2017. This page was last modified on 21 June 2017, at 16:24.